"So glad I found Pro RVI! Rob Wilhelm is fantastic and seriously knows his stuff. I met him randomly on a Facebook RV group and was so glad when he agreed to inspect my pre-owned rig that I had just bought. He not only gave me a full report with 20 pics and 89 points that he had inspected, but he also did a 2 hour lesson to show us everything we needed to know to get on the road. We listed a ton of questions for him and he answered every one, even walking us through where the valves were for the black tank (we would have never known there were 2 valves on opposite sides of the rig). I would not feel comfortable driving or travelling with my new rig without having Rob inspect it. Best money I ever spent". - Jenya R.
Are you a current owner of an RV and would like to get a better idea of the true condition of your unit? Perhaps you have a nearly new RV, your warranty is about to expire and you would like to generate a list of items to have taken care of under the manufacturers warranty, but aren’t sure what to look at. Did you just a buy a new or “new to you” RV and didn’t really have it fully evaluated before you purchased it? Not sure how to use it? If you answered ‘YES' to any of the above questions, contact Professional RV Inspections to evaluate the RV for you. We can even show you how to get your RV set up and how to use it! Our independent, comprehensive and detailed inspection and follow-up report will give you an in-depth look into the real condition of your RV. If you have a motorized unit, sampling of the engine and generator oil, transmission and coolant fluids can give you a very good indication of any issues that may be lurking unnoticed. This can be a far more cost effective way of detecting potential issues compared to having a mechanic open and inspect these components. At times, unfortunately, RVs are brought in to a dealer or even the factory for fairly extensive repairs. Before you accept delivery of your repaired RV, let us do an inspection/repair verification before you spend time and money going to pick it up. If you are comfortable with the basic condition and function of your RV or the one you are considering, but aren't sure if there may be safety issues with it, consider our SAFETY LEVEL inspection. Contact Professional RV Inspections today to schedule your inspection! 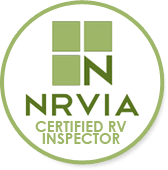 If we are unable to accommodate you for any reason, we are affiliated with a nationwide network of certified RV inspectors throughout North America that may be able to accommodate your needs.